As a child, I naturally gravitated towards art. I always loved putting the pencil to paper, making collages, making a mess and using bright colors to paint my Barbie dolls! As a teenager, my passion for art continued. Instead of sitting in the cafeteria with my friends on a free period, I’d go to Ms. Carrion’s room, my art teacher, to continue working on my class projects. I’m not creating art now so much and I miss it. Last summer I volunteered to seasonally update the Beach 91st Street Community Garden bulletin board. It would be a nice way to contribute and also a way to get inspired and start creating again. I’ve worked on several bulletin boards thus far and they’ve been well-received. This month I was thinking of what I could draw. My mind wandered back to being a kid and the arts and crafts I enjoyed making for Valentine’s Day. Then it hit me: I should ask children in the community to contribute their artwork! It’s a community garden after all and everyone should be able to participate. I reached out to a few of my friends in the neighborhood with children and they were on board (after getting permission from their children of course!). 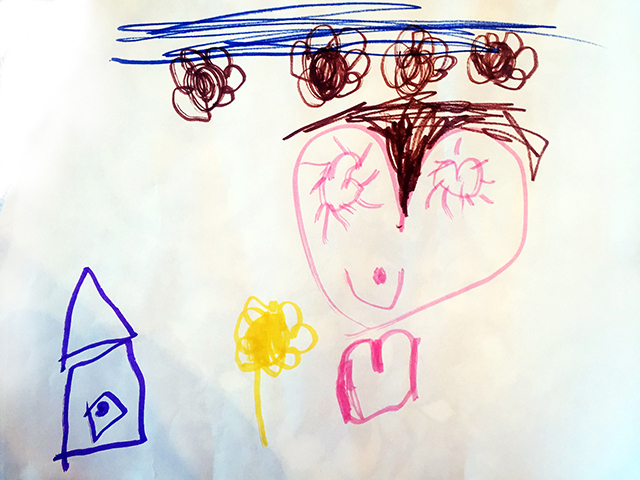 Our local artists are: Augustine Falt, age 6; Bettina Sherwood, age 6; Connor McNeil, age 4 (almost 5! ); and Valentine (especially appropriate) age 4. They created beautiful drawings for the display, which will be on view through mid-March at the Beach 91st Street Community Garden (beach block). There’s something truly special and uninhibited about children’s art that I find so exciting and inspiring. If your child is interested in contributing their talents to the Beach 91st Street Community Garden bulletin board please contact me here. 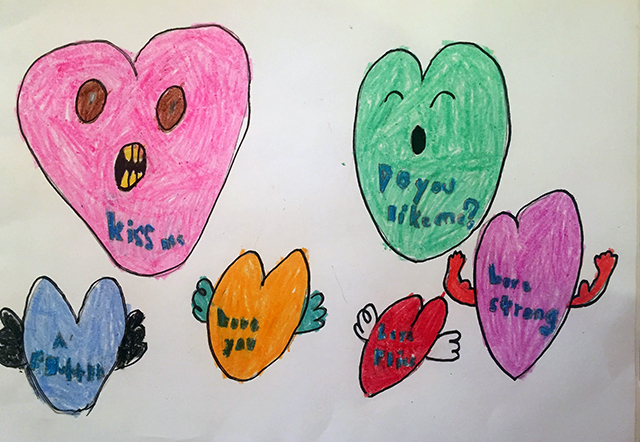 Artist Augustine Falt’s use of bold color for her “flying heart people” makes for an impactful graphic design. Her overall style is detailed (those teeth!!) and humorous all in one! 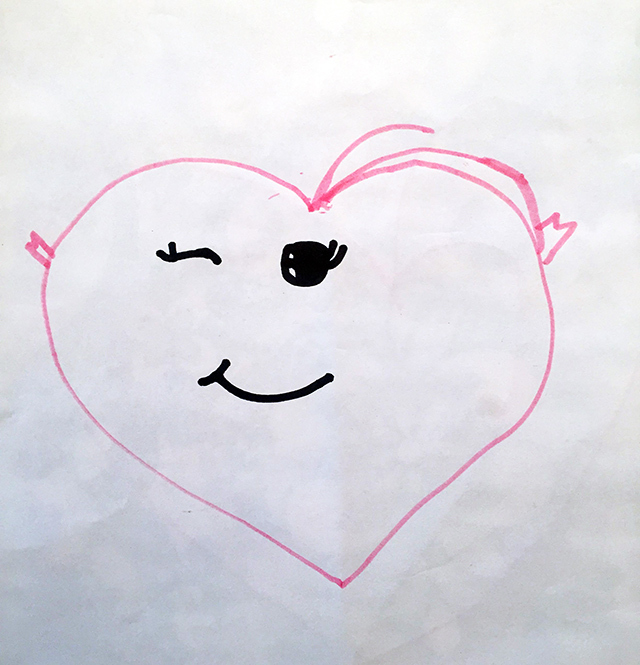 Bettina Sherwood’s heart drawing expresses happiness. Look at that wink! Her use of a simple line drawing and minimal color is understated and thoughtful. Artist Connor McNeil’s style is gestural. The action and animation of his technique is full of life. Note the heart eyes and heart dress, great sense of creativity there! 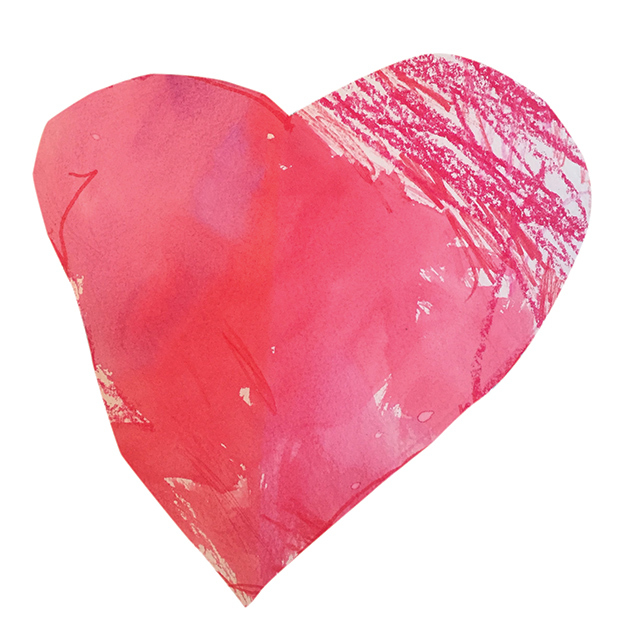 Valentine, who goes by his first name only, is an abstract artist. This work is bold and brightly colored. Valentine’s use of texture is beautiful and engaging. It’s clear that his technique is influenced by Mark Rothko paintings.